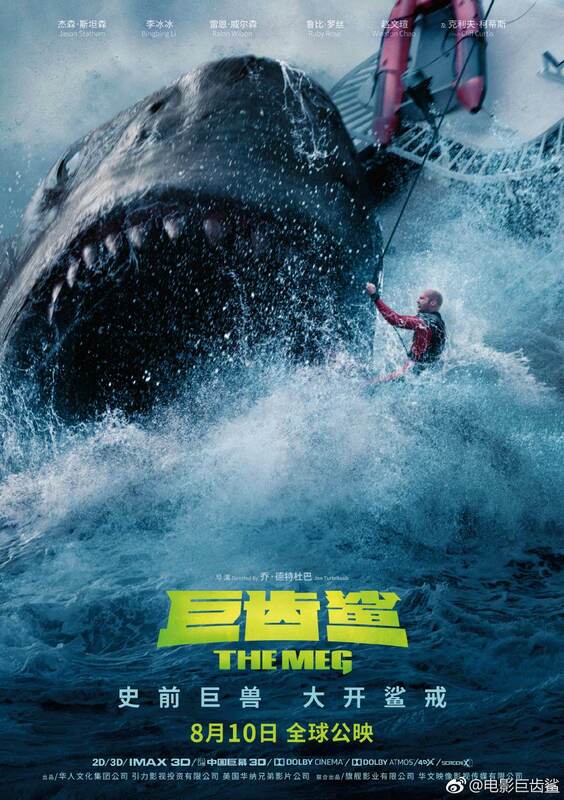 The Meg is that kind of film that is loved and loathed in modern summer blockbuster film making: a full course buffet of everything from action, suspense, romance, comedy and everything in between. You can argue that a much better film would apply only some of the above themes or use them with more panache. If you are this kind of viewer, then avoid this film at all costs, unless you can enjoy at least laughing at the film's excesses. 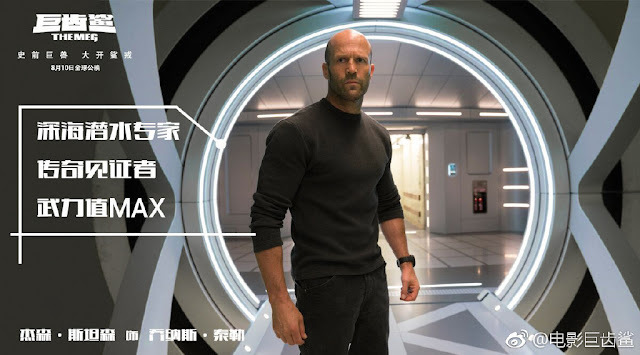 Plot Summary: Jonas Taylor (Jason Statham) is a naval rescue specialist whose deep sea rescue of a submarine crew is interrupted by a violent attack by an unseen massive sea creature that forces Jonas to abort the mission and losing many would-be survivors. 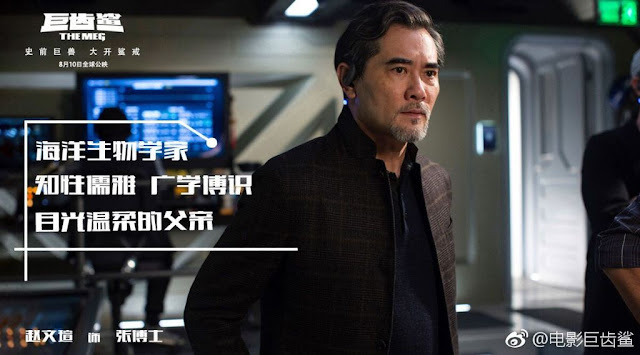 His superiors dismiss his encounter as "deep-sea narcosis" - a condition I have only first heard from watching this movie and supposedly only afflicted Jonas and none of the other passengers on his rescue craft. After this encounter, Jonas leaves the service in disgrace to serve as a simple dinghy mechanic in Thailand. 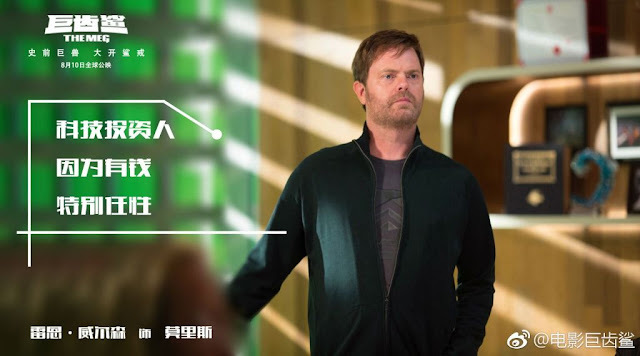 Meanwhile, somewhere off the coast of China, casually dressed billionaire investor Jack Morris (Rainn Wilson) arrives at what looks like an old grimy oil rig which serves as the access point to a futuristic undersea lab called Mana One led by Dr. Minway Zhang (Winston Chao). If you are pondering the meaning or logic behind linking a high tech underwater laboratory to an old oil rig, you are watching this movie the wrong way. The rest of the film's supporting characters are a collection of types that strut around the film like they belong in an action figure play set that includes a menacing giant plastic shark. 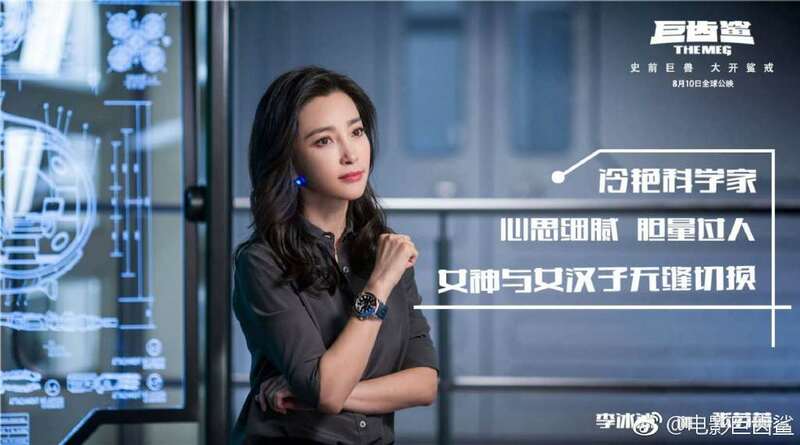 You have Suyin Zhang (Li Bingbing), the strong willed daughter of Mana One's leader. 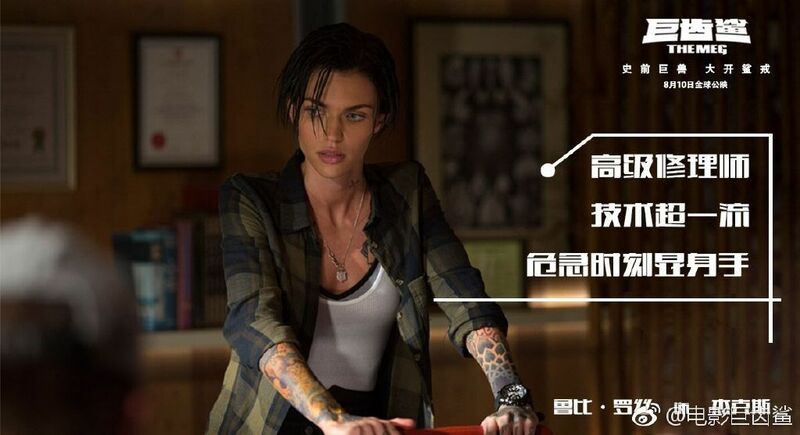 You have the edgy, spiky haired tech genius Jaxx Herd (Ruby Rose) who "designed everything". There's a fat guy with a beard and glasses. A chubby horny Japanese guy. A doctor skeptical of Jonas' sanity. Also a hysterical black guy played by Page Kennedy who cannot swim in spite working deep in the sea and who changes moods as frequently as the film itself. Special mention must be made of Meiying (Shuya Sophia Cai), the nine or ten year old-ish little daughter of Suyin who comes along for the ride. She does a lot with what little she is given since a lot of the film is dominated by the violent behavior of the shark, the intense behavior of Jason Statham and Li Bingbing, and the hysterical behavior of Page Kennedy. This is the kind of film where, in the space of a single minute, we are tensed up by the approaching danger of a shark as large as two cruise ships, followed by the possible shocking death of a character, then inexplicably followed up by the survivors exchanging one liners before getting into some fancy one man submarines that resemble spacecraft with propellers. Speaking of which, the film is a showcase of technical and production design. What it lacks for in pacing and story discipline is overturned by a zealous exercise in designing as many flashy pieces of marine gear as such a loose script will allow. This film makes the mission to dive into the earth's deepest trench resemble a landing on Mars. 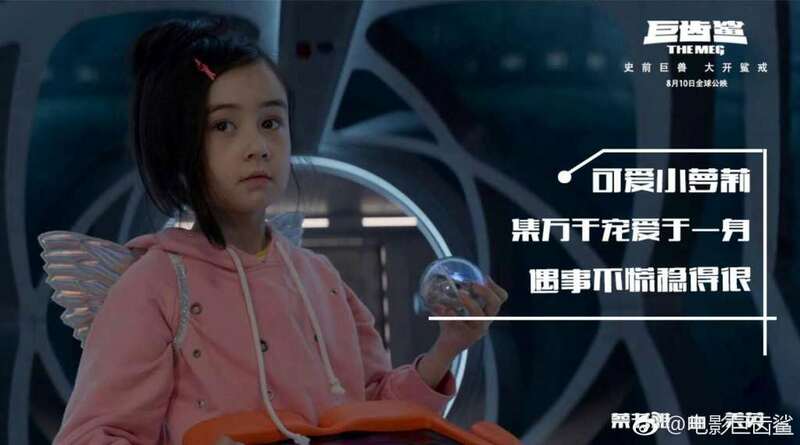 The spectacle of the technology on display is only exceeded by the film's penchant for outrageous encounters and thrilling displays of the Meg's incredible strength and cunning. Director Jon Turteltaub (The Sorcerer's Apprentice, Rush Hour) executes the action smartly, putting the audience through one moment after the next with just enough sensation and visual style to keep proceedings moving even as one grows increasingly confounded by the shifts in tone. The result is a film built up almost entirely of high end design, character gags, semi-realistic cgi shark stuntwork, and Jason Statham's intense (and occasionally dryly comical) expression. Due to constant break-outs of character, you get the impression everyone in this movie knows they are in a movie. Normally this would break suspension of disbelief, but Turteltaub has a deft touch. You may be persuaded to just go along for the ride. 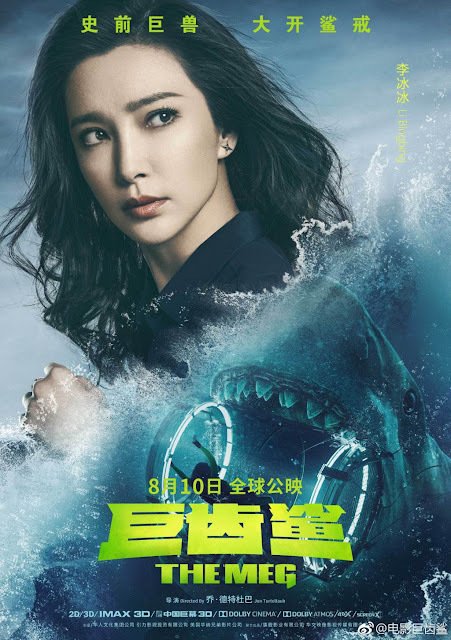 All that said, after a stuttering and uncertain first half, the film does hit high gear at around the 40th minute when most of the premise has been done away with or has been bitten off whole by the massive shark. At that point the film descends into something primal: Man vs Monster. And it is also at this point that you finally get the movie you paid to see. By this point in the story, you are no longer surprised that there's such a thing as polycarbonate shark cages that can absorb an immeasurable amount of force, or that scientists can bring themselves to use whale-killing poisons to murder what would be, in their own words "a fantastic scientific find". It also now seems perfectly sane that the same scientists would re-jig their undersea submersibles with explosive torpedoes and that they now have piloting prowess in these vehicles that make them the underwater equivalent of fighter plane aces. You will believe that covering the ocean with massive bombs to be rid of this giant beast is a totally acceptable course of action. Fish kill? What's that? 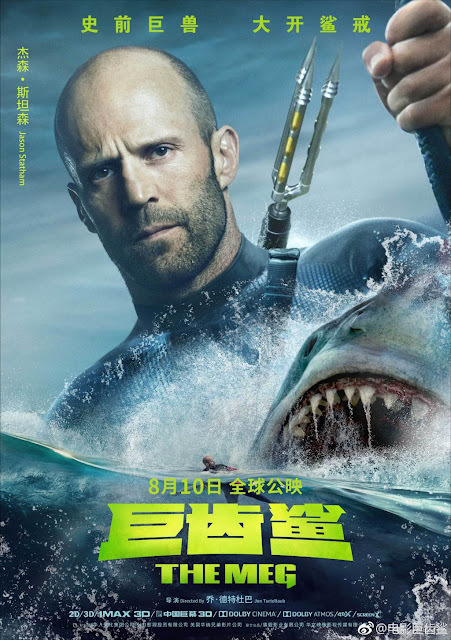 By the 90th minute, you totally expect Jason Statham to get into hand-to-hand combat against The Meg's aquatic prehistoric tormentor. The film does not quite get into such levels of ridiculousness, but the actual finale comes satisfyingly close. If you remembered to enjoy yourself along the way, you will not be disappointed.